There's no love for Wall Street on the 2016 campaign trail. 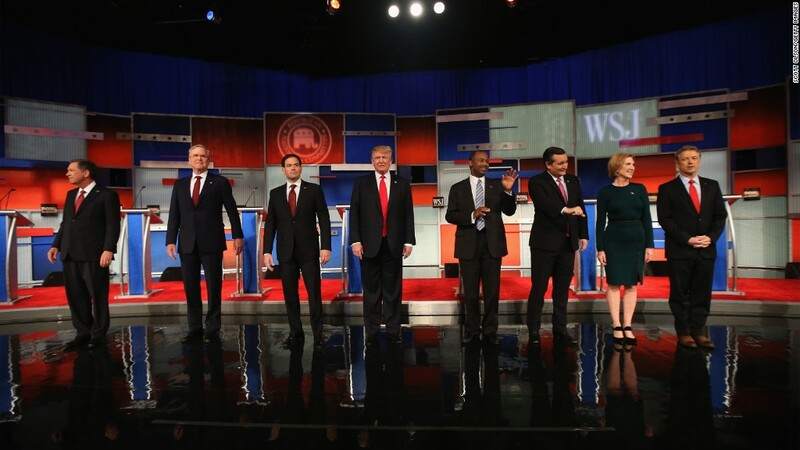 Republicans did plenty of big bank bashing in the Fox Business Network debate Tuesday night. John Kasich said bankers "need a good ethics lesson." Ted Cruz quipped that big banks "get in bed with big government." Even Jeb Bush, who has raised a lot of money from financiers, took a swipe at Wall Street. "We shouldn't have another financial crisis," Bush said. There's concern on Wall Street that Republicans are starting to sound a lot like Democrats on this issue. "It's apparently cool to go after Wall Street fat cats," wrote Michael Block of Rhino Trading. Greg Valliere of Horizon Investments was even more blunt: "A nasty (and ignorant) anti-Wall Street climate prevails in both parties." Bankers say the candidates don't have their facts straight. Regardless of how you feel about the power of Wall Street in politics, they kind of have a point. Here's a look at some outlandish statements that were made last night about the world of finance. 1. Jeb Bush proposed a solution that's already in place. Bush doesn't want another financial crisis. His fix is to "raise the capital requirements so banks aren't too big to fail." But that's exactly what the Dodd-Frank financial reform bill enacted in 2010 did. It forced banks to hold onto more cash -- think of it like rainy day funds to use in times of crisis. The capital levels at America's six biggest banks are over 30% higher now than they were five years ago, according to SNL Financial. 2. Ben Carson doesn't understand what caused the 2008 crisis. Carson implied that stock buybacks -- when companies use some of their money to purchase shares of their stock -- led to the financial crisis. He said that very low interest rates made it easy "to buy back their stock and to drive the price of that up artificially. Those are the kinds of things that led to the problem in the first place." There have been a lot of policies blamed for the financial crisis, but stock buy backs are not one of them. 3. Marco Rubio seemingly wants to eliminate all financial reform. Rubio wants to get rid of Dodd-Frank, but he hasn't discussed what he wants to replace it with. "In Dodd-Frank, you have actually codified too big to fail," he argued. It's true that banks have become bigger since the crisis, but it's unclear how eliminating Dodd-Frank would change that. Wall Street certainly doesn't like many of the provisions in Dodd-Frank -- a 2,300 page law. JPMorgan (JPM) CEO Jamie Dimon has said banks are "under assault" from all the new regulations. But most people agree the law has made banks curb some of their riskier practices and hold more money in reserve. Should America bail out banks? The one substantive part of the debate over Wall Street was when the GOP candidates clarified whether they would ever again bail out a bank or financial institution like insurance giant AIG (AIG). Ted Cruz said three times on stage that he would "absolutely not" bail out a big bank like Bank of America (BAC) if it got into trouble. Kasich challenged him: Would he really let Bank of America go under if regular Americans might lose money? Bush wouldn't directly state his view, stressing instead that the key was simply preventing a crisis from materializing again. That might be the ideal, but there weren't many ideas offered Tuesday night on how to do that.